Add H4K20me2 monoclonal antibody - Classic to my shopping cart. Request a quote for a bulk order for H4K20me2 monoclonal antibody - Classic. Please fill out the form here below. Your local sales account manager will get in touch with you shortly and send you a quotation based on your requirements. 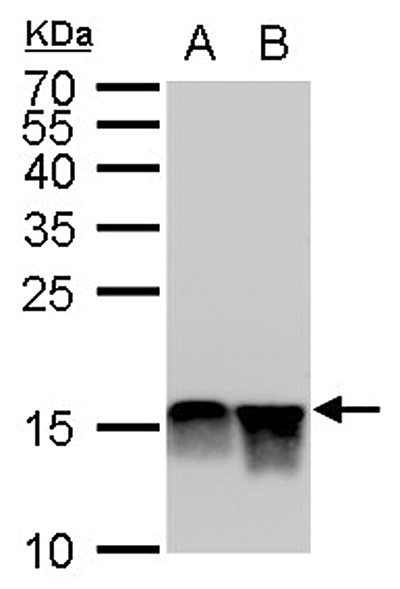 Monoclonal antibody raised in mouse against Histone H4 (di methyl Lys20) (histone cluster 1, H4a), using a KLH-conjugated synthetic peptide. ChIP was performed with HeLa chromatin extract and 5 μg of either control mouse IgG (Cat. No. C15200001) or H4K20me2 antibody. The precipitated DNA was detected by PCR with primer set targeting to MyoD. 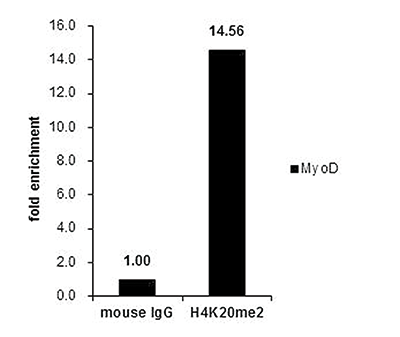 H4K20me2 antibody detects Histone H4 dimethylated at Lys20 at nucleus by immunofluorescent analysis. Green: Histone H4 (dimethylated at Lys20) stained by H4K20me2 antibody diluted 1:500. Diagenode strongly recommends using this:	H4K20me2 monoclonal antibody - Classic (Diagenode Cat# C15200205 Lot# 41582). Click here to copy to clipboard.